Seems the large SEZ project they mentioned in AR and claimed to have reached a very advance stage of negotiations, have been awarded to them. Above pic is from their site under services / civil construction section. In affordable segment, gov provides all the raw material like cement, bricks, steel etc and is paid for directly by them. This makes it an asset lite and less capital intensive business. Labor are sourced and employed by Uniply. Payment by gov agency is in phase manner. Projects in Talangana got delayed due to election but confident of achieving the 1200 cr topline targtet. It may get pushed to next financial year again due to election outcome. To me this looks a good asset lite business model. They don’t have to commit or invest any large capex to get the business. It’s like the “heads I win, tales I don’t lose much” scenario. My only doubt being, what is stopping the real estate players to get in to this space ? Dics - invested and is the top holding in my PF with 15% allocation. Substantial portion of shareholding stands pledged now. 1.36% (total 11.76%) held by Keshav and all shares held by Madras electronics. This is in addition to previous pledges. Combine this with promoter buying earlier this quarter, this would indicate that promoter has confidence in the business / promoter feels that company will reward over longer period but this also means that currently company is facing working capital pressure with no other hard collateral available to provide to bankers. Think, it is prudent to stay alert in light of recent pledging. Can anyone in contact with the company confirm what has been the end use of promoter pledging? Is debt capital ploughed back in the same company? / Has it been used for buyback of Uniply Ind / Uniply Decor from open market? Is it possible that money has been diverted to some other company? Also, It will be great if we can ask them to disclose more on pledging (generally no promoter does) and start investor con calls. Promoter buying on 20 Feb, but still script is going down. Is there any change in fundamentals ?? Rating is withdrawn / Company is not co-operating with rating agencies. Can anybody check with the mgmt on the reason for this? Decor is controlled by same management. The decision of stopping rating exercises / sharing data across group companies is a big negative. When companies don’t agree with the outcome (downgrade / status change) that rating agencies have provided. Solution - tap other agencies, also called rating shopping. Can there be any other scenarios? I have several concerns regarding the rapid changes in stated strategy, flows of cash, among others. Promoter Keshav N Kantamneni (KNK) bought Uniply Industries Limited (UIL) citing a large untapped space in the plywood industry (total market size of INR 20,000 crore, organised of 30%, and UIL share within organised being just 3%). Spoke about acquisitions of assets in west and north India amounting to INR 20-25 crore to enhance capacity under UIL banner (however, just EuroPly acquisition cost INR 42 crore). Fast forward a few years, the entire plywood division of UIL is sold off to Uniply Decor Limited (UDL) as a slump sale of INR 147 crore (annual report speaks of an ‘economic value’ of INR 300 crore through just divestment). This is after talking at length about plywood business of UIL having very high quality. 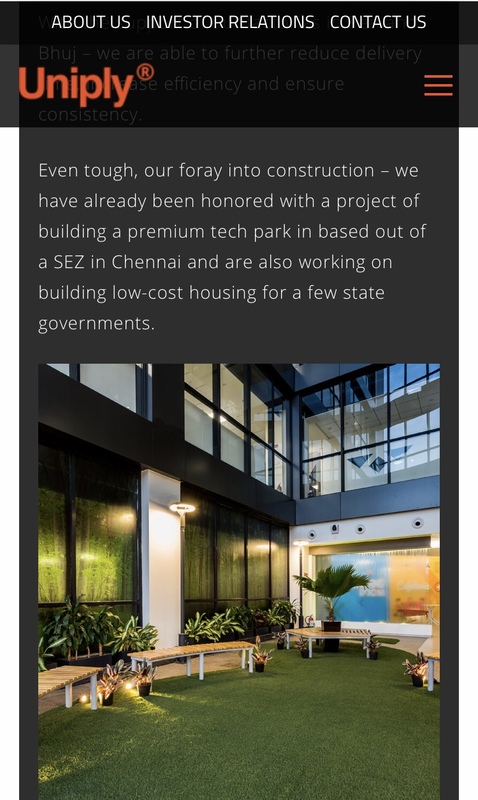 Further, UIL purchases Vector to enter B2B segment of home construction business (including MEP and becoming a PWD accredited contractor, while still calling it ‘one of India’s largest interior design and fit-out companies’). UIL had several successful rounds of fund raising to fund such acquisitions. Further, warrants were issued too. Just a few years, and the business of UIL (as acquired by KNK) pivots from B2C high-quality plywood to B2B contractor jobs. And now, UDL would have to pay UIL annual royalty of INR 7.5 crore to use Uniply brand name (note that UDL’s PBDT, per a cursory look at www.screener.in, stood at INR 3 crore as of FY18). To fund this, UDL issued shares amounting to INR 111 crore. For UIL to purchase these shares of UDL, funds were raised from investors/promoters. As per AR for FY18, value of assets purchased by UDL stood at just INR 2.09 crore (pg 192). The reduction in fixed assets (gross block) was INR 25 crore - where did the rest of the fixed assets go? There was no loss on sale of assets (per cash flow statement of UIL) - curiously, KKN Holdings or KKNH (earlier called Foundation Outsourcing India Private Limited) in UIL’s AR18, for the prior year (FY17) cited INR 23 crore as sale of fixed assets to KKNH from UIL. Curiously, no mention of this was made in the FY17 annual report. Does to have anything to do with the sale of fixed assets of the plywood business disposed by UIL? KKNH also was (very charitably) given a loan, called ‘Advance for investment’ of INR 260 crore in FY18, by UIL. Per UDL’s AR18, a resolution was passed to issue/allot 10.8 crore share of UDL to promoters and non-promoters on preferential allotment basis. Note that the earlier issuance of UDL shares to UIL and others was done at INR 25/share (in respect of the non-cash transaction pertaining to the plywood business slump sale). The math (25/share x 10.80 shares = INR 270 crore) is surprisingly close to the loan given by UIL to UDL. So minority investors paid money to be in a plywood business which then became a contracting business and now their money is going as a loan to an entity held by the promoters to (perhaps?) purchase shares in the plywood business. As of end FY17, debt at UIL (standalone) stood at INR 64 crore, of which 17.6 crore was unsecured (mostly from Vector). As at FY18, debt increased to INR 97.4 crore, almost all of which was unsecured and came as a loan from UDL. CRISIL withdrew ratings at the request of UIL (likely since there were no external secured fund limits to be rated) - does this also mean that UIL is unable to obtain bank funding (Vector is working capital intensive) because of the high loans of over 300 crore given in FY18 to various related parties? There was a sale of UIL’s share in ETA Technology Park through which UIL gained INR 10 crore as profit on sale of investment. However the proceeds from sale of investment stood at INR 10 crore too. Zero cost asset? Also, where is this reflected in the balance sheet in earlier years? Pledges have been created and increased to seemingly informal sources perhaps to secure working capital funds. But the price keeps falling, and the value of the shares pledged as security for the funds secured, keeps falling, so more shares need to be pledged, and so on. Will UIL (which owns rights to Uniply brand) make investments to build the Uniply brand? If so, how will it leverage it when its business is primarily driven by Vector’s networks and reputation? If not, then will UDL have to do it, while it is already paying royalty to UIL? Add to these concerns, the issue of procurement of quality raw materials (wood) for UDL, the working capital cycle for Vector (which is now the sole driver of UIL’s business), etc. I have more questions than answers for this business. Ironically, I have not even discussed the business so far, just intangible issues. I had bought shares before doing any diligence, and exited at a small loss. True . Very valid points. Is somebody connected with Keshav to check on this? As of FY15, UIL’s share capital stood at INR 17.31 crore. With the preferential allotments and conversion of warrants to equity shares to promoters and non-promoter institutions, FY18 share capital stood at INR 23.91 crore (latest equity share capital is INR 33.04 crore). In FY18, there was a resolution to issue and allot equity shares and warrants (convertible to equity) of 1.46 crore shares of FV 10/- (or 7.29 crore shares of FV 2/-). If fully allotted, the share capital would enhance to INR 38.49 crore, resulting in a dilution (since FY15) of ~120% - this is important since the cash flow per share (perhaps the important metric) and earnings per share would be less than half purely due to such dilutions. Admittedly, the conversion has been happening at a rate of INR 82.17 (inclusive of premium of FV:2/- shares) which is higher than current price, but how the promoter would fund this remains to be watched closely. It is fuzzy because the promoter (KNK) and promoter entities have been buying shares in the open market (seems a sensible thing to do), also selling shares in the open market (this is likely forced selling); there have been changes to pledges (mostly increases to top up collateral for working capital on account of decreased share price). a) investors bought into UIL for the burgeoning scope of UIL’s high quality and undervalued plywood business, but the business is not plywood at all now - it is now a contractor, with the narrative that margins and ROIC would be high(er). Would investors feel comfortable according a secular consumer business multiple for a cyclical contractor business (Vector)? b) Investors in UDL (to which UIL’s plywood business was sold to) are likely to face substantial further dilution. As @rohitbalakrish_ mentioned earlier, the Uniply brand is seemingly not as strong as it is made out to be, so would such royalties payable to UIL be justified? So, Keshav sold 1710974 shares from his own Promoter Acquired Company (PAC) “Madras Electronics” and purchased on his own name on 28th March after hours. Since, either way, the shares will be with Keshav, I think one reason of doing this could be so that his promoter pledging goes down (if he holds more number of unpledged shares) for Q4 and FY2019 or it could be increase his diluted holdings. Additionally, I have always seen a pattern where the promoter and promoter group transact heavily in the quarter end, I assume to better the shareholding for that quarter (whenver the shareholding is made public), however strangely start pledging shares once the quarter begins. Like even recently on 19th Nov’18 he sold more shares than what his own PAC could purchase, thereby resulting in some free cash with him. Not sure what could be the motive behind these frequent transfers within PAC. Nonetheless, the pledged shares are only increasing giving me jitters along with ballooning debt. In a CNBC interview in Q3’2017, KKN mentioned that all shares will be unpledged by Q3’2017 end…and here we are with only more shares being pledged in the name of working capital. All this gives me the impression that the company is under serious cash crunch, may be because of expensive acquisitions done in the past and partly also because how untimely payment from Government contracts tend to be. I hope I am proven wrong here ! !